They should call this "yum bo". As in really good. I usually put together a pot of seafood gumbo each Christmas Eve. It's not hard to make, but it does take a little time as several steps are involved. The only part that requires care is the making of the roux. Get a nice big pot. Add around six cups of cold water. 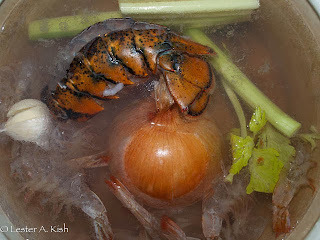 Add shells of shrimp, lobster, etc. One whole onion cut in half, a couple of stalks of celery, garlic clove. Simmer for a couple of hours. Add water if you have too. Don't want to cook it down to nothing. Strain and discard the shells, veggies, etc. This is the tricky part. Heat around three-fourth's cup oil in a cast iron skillet. Drop in about the same amount of flour. It will bubble. Start stirring and keep stirring. It should brown nicely. Screw up and it will burn like Yellowstone in '88. Seriously, just keep stirring. You might need to adjust the heat on the stove. 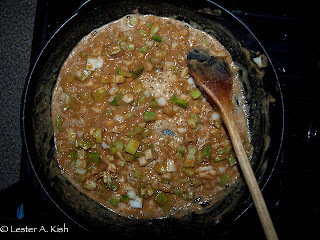 Once it's suitably browned, add some of the chopped pepper, onion, and celery. Keep stirring for a couple of minutes. 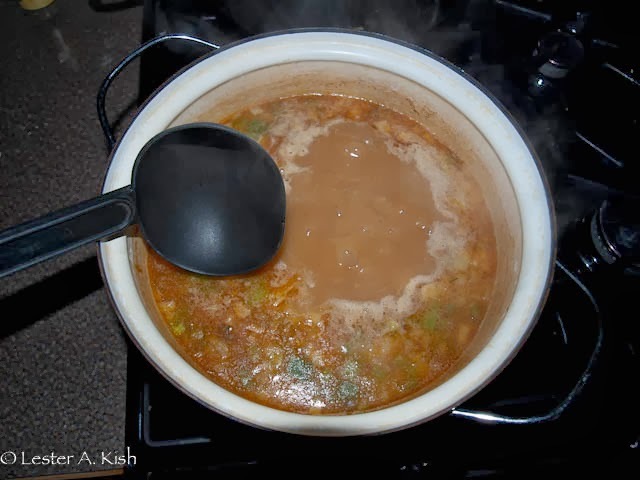 Some of the seasoning can be added at this point, or…you can wait and add it throughout the cooking process. 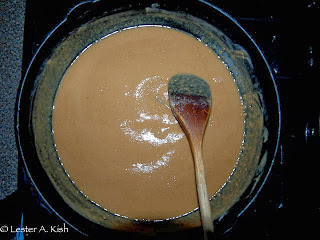 I like the roux a coffee to light chocolate color. You can get it pretty dark and not be burned, but I think the flavor is a little strong for a seafood dish. You decide. Bring the stock to a boil. Add the roux by spoonfuls. Be careful, sometimes it spatters! Stir. Add the rest of the chopped onion, green pepper and celery. Add the thyme, bay leaf, smashed garlic clove and a little seasoning mix. A couple of dashes of Tabasco (I also added a couple of dashed of Melinda's Habanero Sauce). Let it simmer. The oil will begin to collect on the surface. Just skim it off. I usually let it simmer for a couple of hours, skimming off the oil, tasting, and adding seasoning until it's about as hot as I like. 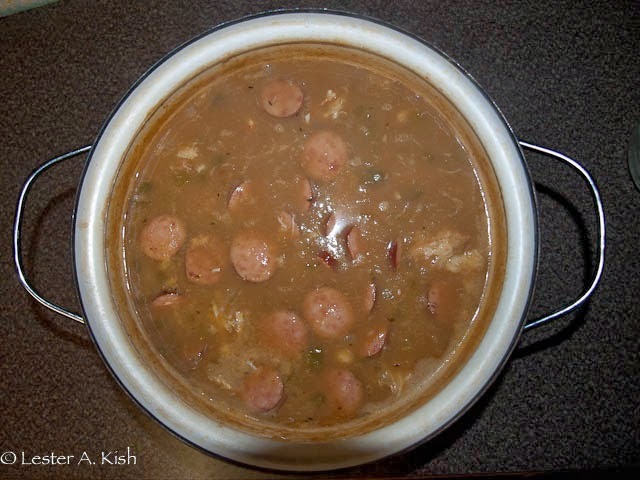 If it's a little too hot, as in spicy, the seafood will mellow it out once it's added. Oh, the Polish sausage can be added right at the beginning too, although I'll often wait 'til the gumbo has cooked for a half hour or so before adding it. Do this when you are ready to sit down and eat. The seafood cooks really fast, like in a couple of minutes. 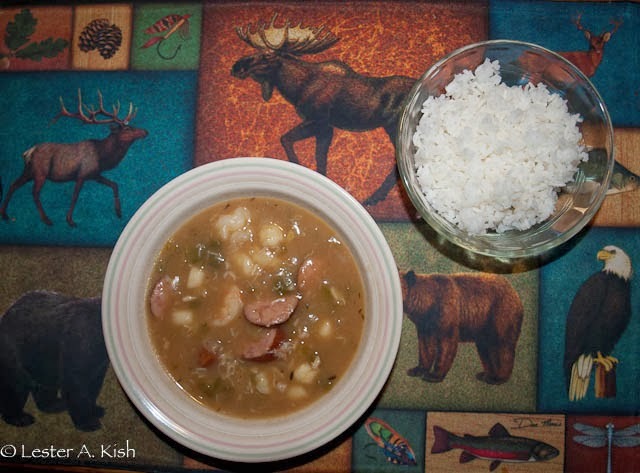 Just bring the gumbo to a boil, add the seafood, stir, and get ready to eat. Dish it up. Garnish with chopped green onion. It goes well with a side of white rice. Fresh bread is good too. I always thought that it went well with a bitter beer like those made by Red Hook in Seattle. But alas, I no longer drink. You can start with equal parts of each. Taste and adjust the proportions to your liking. I usually add about two to three parts of onion and garlic powders and paprika to each part of the others. Playing with the proportions will vary the "heat." I keep a shaker of this mixed and handy at all times. It's good on barbecued meats, eggs, etc. Enjoy! If you've got the time it's really worth it.